This recently renovated home with easy access has been appointed with all brand new designer furnishings and lovely antiques. The main living/dining and kitchen area is open plan with large bi-fold doors opening to the deck and additional outdoor seating and BBQ area. The kitchen is equipped with all modern stainless appliances and everything you would require to present a meal. Two double bedrooms, a full bathroom, separate powder room and laundry are also located on the ground level with the master bedroom with ensuite, second lounge area and deck located on the upper level. Waiheke Island is known for its stunning beaches, amazing coastal walkways and world class vineyards and restaurants. 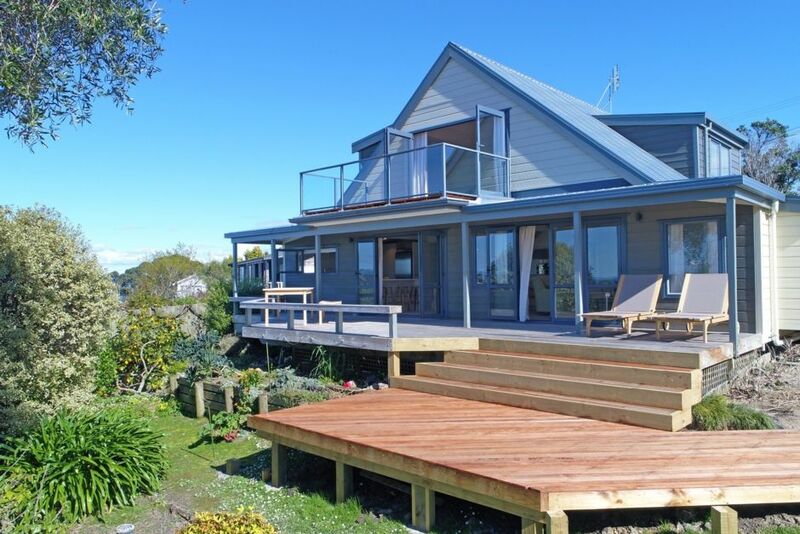 The close proximity to the village and ferry, white sand beaches, Mudbrick and Cable Bay vineyards make this property a perfect accommodation choice for a stay on Waiheke Island. Loved the house, its location and the thoughtfully stocked pantry. Would be happy to stay anytime. Views breathtaking. This house was absolutely perfect for our group of 3 couples. The decor was great, beds comfortable, appliances top end and the home had absolutely everything we could possibly need. The house was spotless and the views spectacular and a short walk from Oneroa shops. None of us wanted to leave.